As part of my trip back home to the bay last week I was able to stop by Chapeau! and catch up with an old friend. I’ve been on this quest to broaden my experiences with French cuisine and Chapeau! was a great addition. The menu had a cute story about how chapeau without an exclamation means “hat,”, whereas Chapeau! means “wow.” I ordered a glass of Cabernet and it went wonderfully with the food. The Chef even came out at the beginning of the meal to shake our hands and thank us for coming. It was definitely a sign of good things to come. 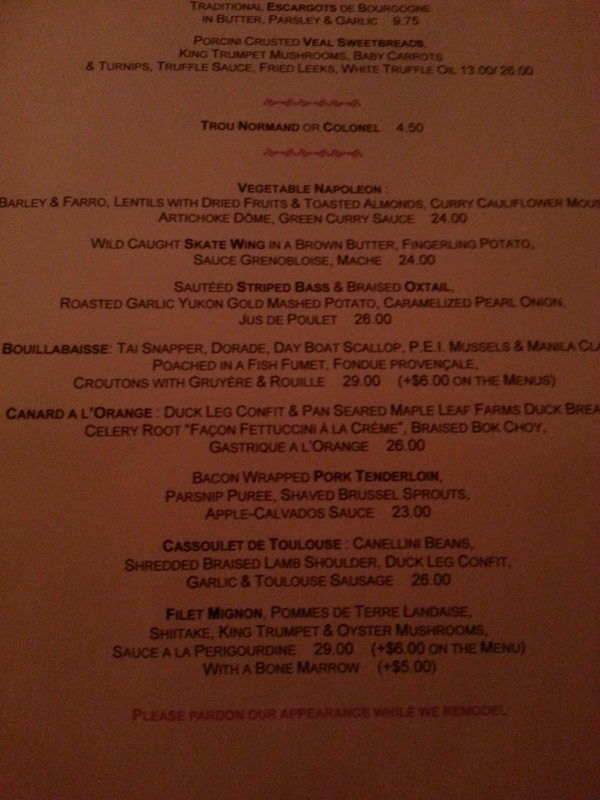 Here is the menu (sorry the room was super dark and almost romantic, so the pictures are QUITE dark and I couldn’t really take great pics. Trust me though, the food was pretty amazing overall. We decided to go for the three-course pre-fixe. 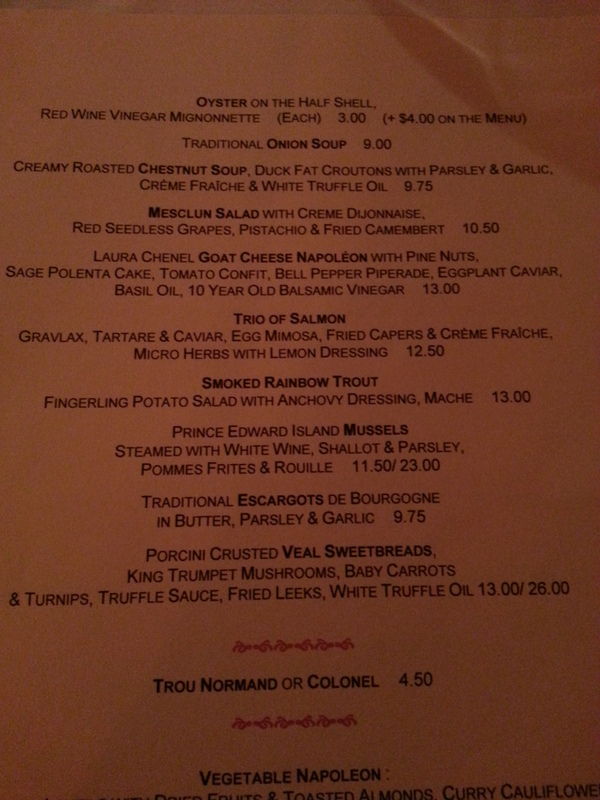 I ended up ordering the goat cheese napoleon, cassoulet, and apple tart. All pretty “french” I think – although I’m not enough of an expert to really be sure haha. 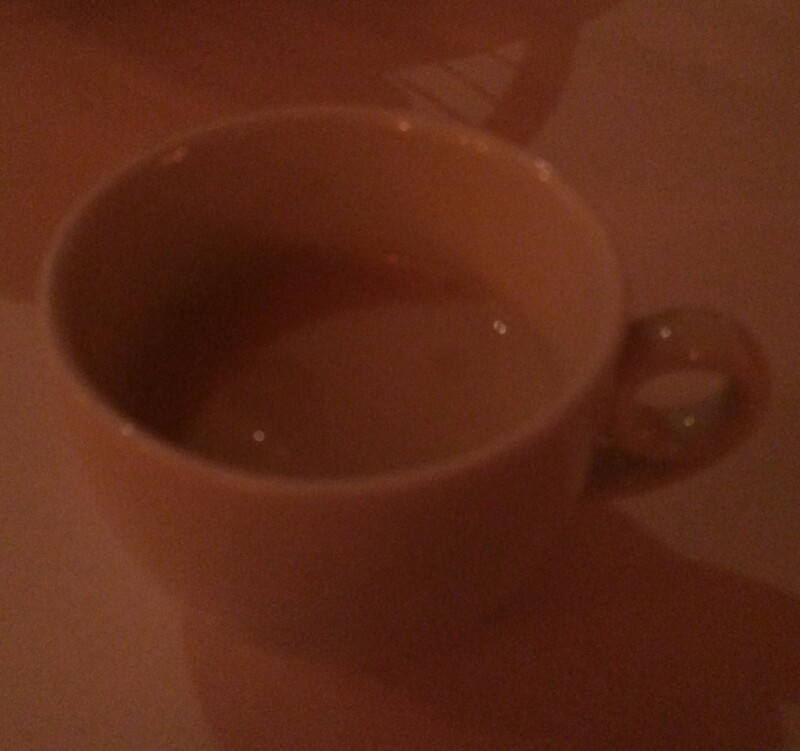 To start, there was a cauliflower soup amuse bouche with notes of truffle in it…I think it was truffle oil. The soup was wonderfully rich and the truffle aroma certainly warmed the senses for a few great moments. 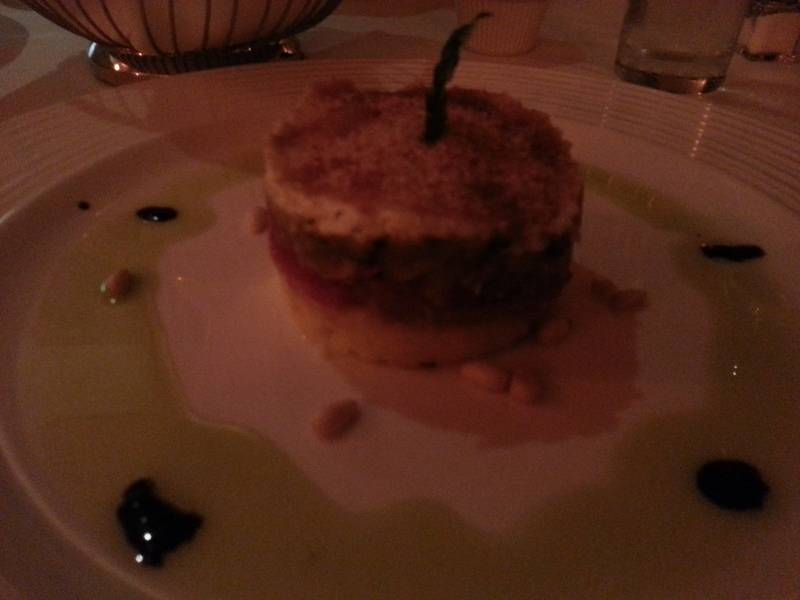 The goat cheese napoleon was absolutely fantastic. The crisp top of the napoleon and the interspersed pine nuts provided a great crunch to the otherwise gooey melted goat cheese. The tomato and eggplant pierced through the richness of the other elements and brought a really fresh taste to the mouth. The textures and flavors were awesomely complex and yet simple in its pleasure. I wouldn’t change a single thing about this dish – it’s one of the more memorable things I’ve had in a long time. 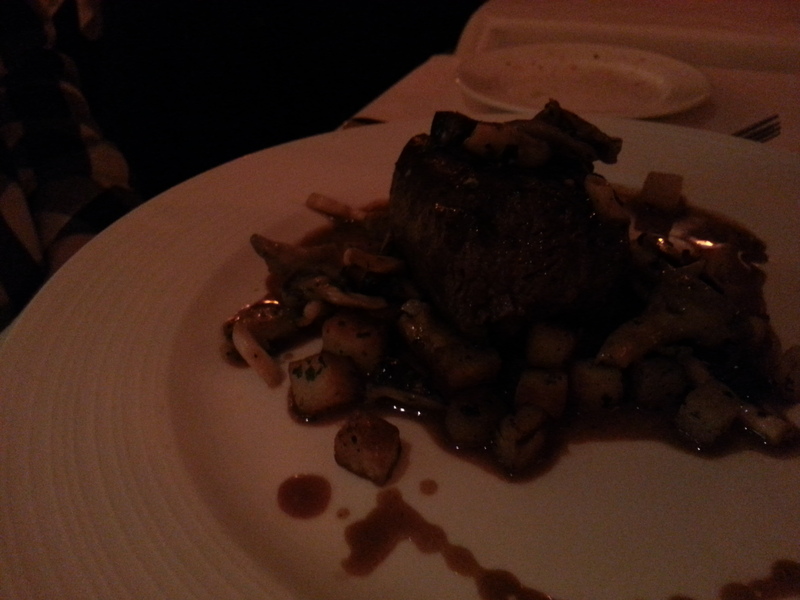 Tran was nice enough to cut me off a bit and let me try her filet mignon. The meat was pretty flavorful and tender. I think filet + awesome mushrooms is a pretty safe bet to be good, and Chapeau! certainly didn’t mess it up. 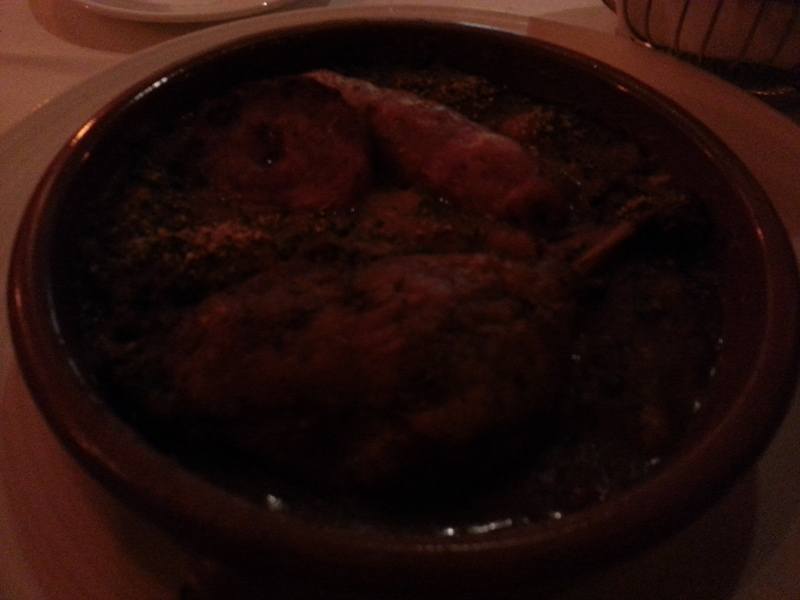 Seriously, the romantic lighting of the place just prevents me from clearly capturing the amazingness that is the cassoulet. It seems like a dish that has pretty humble origins – beans, sausage, lamb, and duck. But it’s oh so good and well-made. The beans have a lot of meat to them, in addition to the actual meats on the plate. Everything tasted of butter, various spices, and meat. The gameyness of the lamb was welcomed as a pleasant contrast to the richness of the duck. The sausage I thought would be kind of a throwaway but it was bursting with garlic and other flavors. I really couldn’t have imagined such a rich dish being still complex and nuanced with the different components having such distinct flavors. 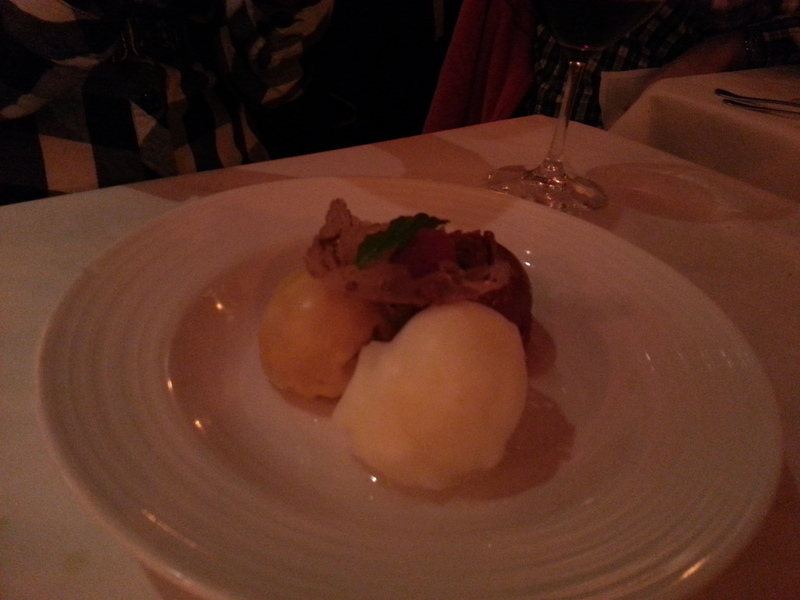 For dessert, Tran got a trio of sorbets, including apricot, lemon, and raspberry. She said she wanted something light and refreshing, which the sorbets certainly were. Me on the other hand, I wanted the apple tart. It came with a caramel ice cream and the tart+icecream worked wonderfully. The ice cream was a tad too sweet, but I think I almost always find caramel ice creams to be too sweet. 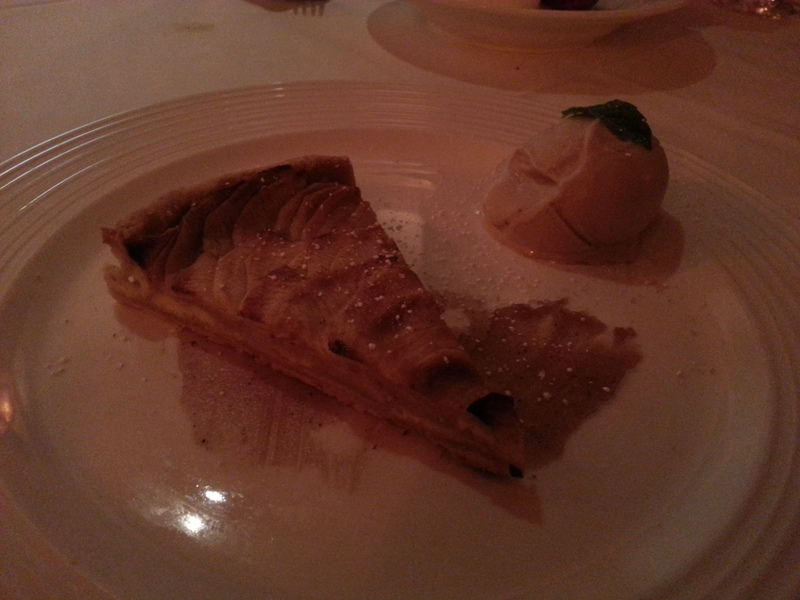 The apple tart was really buttery and maybe quite appropriately ended this “very french” meal for me. I really enjoyed Chapeau! – it’s not going to knock your socks off at the get go, but I can easily see this place slowly seducing diners into a long-lasting romance.